The Australians have introduced an innovative competition as part of the 2015 Australian Junior Chess Championships – a Guided Problem Composing. It’s open to everyone — young and old, local and overseas, new and experienced composers. So why not have a go? You may discover a new and fascinating hobby! Full details here. This is a very welcome and hopefully successful enterprise by our Australian friends. 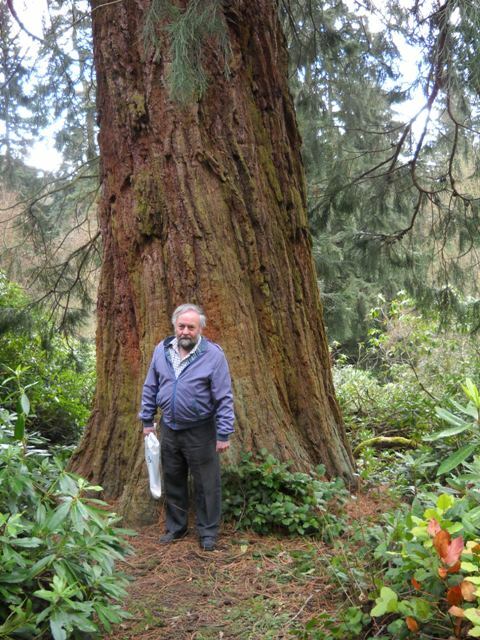 Paul during the visit to Cragside, which was the excursion enjoyed by those attending the recent residential weekend at Newcastle. Photo: Neal Turner. With the sudden death of our Treasurer Paul Valois, the BCPS has suffered a devastating loss. In addition to the role mentioned above, he served our Society in many ways over many years, including being our President for two years. He was editor of The Problemist and sub-editor of the Selfmates section of The Problemist, both for an extended period of years. His time and expertise were always willingly given, both to the committee and to our membership, who regularly consulted him. 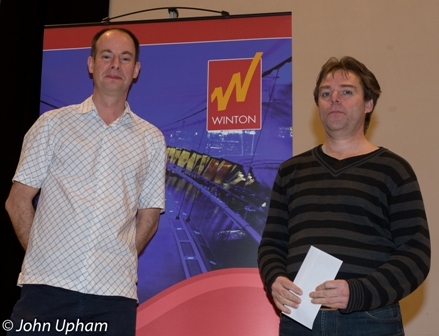 As solving coordinator I will miss his competent assistance, especially with the starter round of the Winton Capital British Chess Solving Championship. He could be relied upon totally. He was very good at suggesting possible problems for use in the championship and I mostly took his advice. In more recent years he also managed the ongoing work of binding the various magazines that arrive in my house as part of the BCPS Library. He always had worthwhile ideas and put his points quietly and effectively. I never heard him raise his voice. He was a gentle soul and easy to get on with. That didn’t mean that he was a pushover. I never heard anyone say a bad word about him and I know just in what high esteem his colleagues in the BCPS and chess problemists around the world held him. The BCPS offers its sincere condolences to his sister Andrea, who survives him. A recent picture of Paul. Photographer unknown. Barry Barnes: That’s terrible news about Paul. My head i full of good things to say about his quiet, self-effacing self. Everything he did for the BCPS – his translations, his travels, his involvement in solving events, his organising BCPS Weekends, and the variety of Society positions he held – was done totally competently. His was an unquantifiable amount of invaluable hard work over a lifetime. He was quite exceptional. Yet he remained a very private man. To me, he never seemed to age. He will be sorely missed. David Friedgood: Having recovered to a degree from the initial shock, I have also been reflecting on the good man Paul was, and what a terrible and premature loss our Society has suffered. As Barry describes, he was amazingly versatile, throwing himself 100% into everything he took on. I recall gasping at his bravery in putting himself forward for the Treasurer role; I knew he would be able, Atlas-like, to shoulder the sheer labour of it, but how would he cope with the considerable technical trickery required? With help from Geoff Hicks, he mastered it completely. Paul was a generous person, and not only with his time. As a fellow endgame study buff he has given me books on the subject on a few occasions, the last being at the recent WCBCSC, when he produced Smyslov’s anthology as though out of a hat, knowing that I had been trying to get hold of it for a long time. On all these occasions my attempts to provide cash were refused with his particular brand of quiet vehemence. He seemed to be a solitary soul, yet he’ll be remembered by many. David Shire: He was a tireless worker for the BCPS, but most importantly, he was a very nice bloke! Hans Gruber: So hard to believe ... we were quite confident to meet Paul again at this year’s (40th) Andernach meeting, a meeting which Paul had attended so often ... Paul was so calming in character, and his tremendous command of foreign languages was so helpful to gain such an important person in international issues (his Russian was famous, and his German was really good; I cannot judge his French). I offer my sincere condolences to the British problemists on behalf of Die Schwalbe. Bernd Gräfrath: I met Paul in Andernach, and I also had contacts with him in his function as treasurer of the BCPS. Our contacts were not very close, but the reason for this may have been that he was a very private person. I always found him to be very reliable; and perhaps only the British members of the BCPS can properly appreciate all the work which he has done for the BCPS. I always enjoyed reading his Problemist section on selected studies; and it will be hard for the BCPS to find members who will be so able and ready to contribute so much to The Problemist and to the other activities of the BCPS. Rauf Aliovsadzade: My deepest condolences to the BCPS for the passing away of a great man, Paul Valois. May God bless his soul. John Beasley: A very, very sad loss. 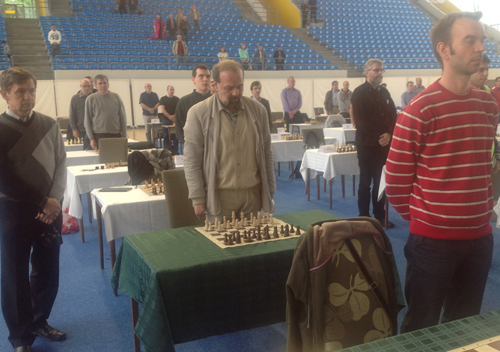 I have posted my personal tribute on www.jsbeasley.co.uk (click on Orthodox Chess, then on Endgame studies or Problems). Don Smedley: I was extremely sorry to hear about Paul Valois. We had been good friends for many years, from the time when he used to possess a season ticket for Derby County!! He was very kind to me, especially letting me have many East European #3 awards, and even doing the occasional bit of Russian translation. Nothing was too much trouble for him. Klaus Wenda (Hon. Pres. of WFCC [World Federation for Chess Composition, once known as the PCCC]): It is with great distress that I learned the sad news. Paul’s sudden and unexpected death is a hard loss that the BCPS has suffered. He was one of the most reliable and generous problem-friends I´ve ever met at the occasion of the annual PCCC Meetings. I always admired his discreet and in the result extremely effectual way to organize and to settle even complicated issues. One of the highlights in this connection was the PCCC Congress in Bournemouth 1989. I shall remember Paul with deep affection and my condolences go to the BCPS and the editorial team of The Problemist in particular. Harald Rüdiger: I’m very sad to hear of Paul Valois’ death. Thank you for a great long-standing friendship, Paul! Andy Kalotay: The news about Paul is truly shocking; we go back to the Budapest conference, around 1988. 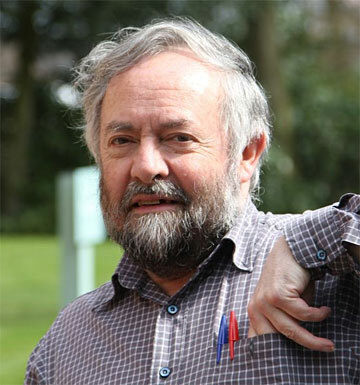 He has been a major contributor to the Society; it is hard to imagine a meeting without Paul’s presence. He will be missed by all of us. Mike Prcic: All American problemists are saddened by the untimely death of Paul Valois. During the many congresses we attended, Paul and I have spent many hours just shooting the breeze and occasionally even talking about chess problems. Paul was a kind person with an even temper. He will be missed by all of us who knew him. On Wednesday, May 28th, my wife Virginia and I are planning a memorial (POWA) at our local Buddhist center for Paul. I was very saddened by his death and Virginia suggested we do this. Jorma Paavilainen: It was a shock to hear of the passing away of Paul Valois. The sad news silenced the participants of the ECSC opening ceremony in Igalo, many participants having fond and personal memories of Paul. Jonathan gave a short, but very touching speech in Paul’s memory and a moment’s silence was held. I had the pleasure to meet Paul for the first time at a PCCC meeting in the end of the 1980s. Possibly in Budapest 1988, but I am not 100% sure if we met there or in Bournemouth one year later. However, since the first meeting we met on a regular basis at the congresses and other chess events, the last being the Nunspeet meeting in the spring of this year. Paul was always friendly, gentle and helpful. He never seemed to put himself into the center of attention – instead it was very typical of him to ask at the start of the conversation how either I or the other Finns were doing. Paul will be sorely missed. Andrea Holt, (Paul’s sister): Thank you all for your kind and generous comments about my late brother Paul Valois. They have been a great comfort to me and my family at this sad time. 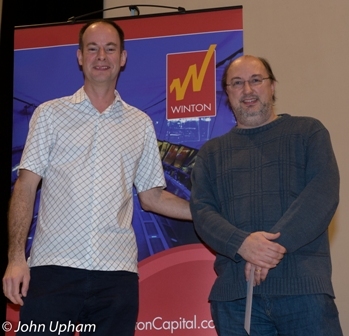 Here are some photographs of the prizewinners at the Final of the Winton Capital British Chess Solving (WCBCSC), 2013-2014, receiving their prizes from Gordon Brown of Winton Capital Management. 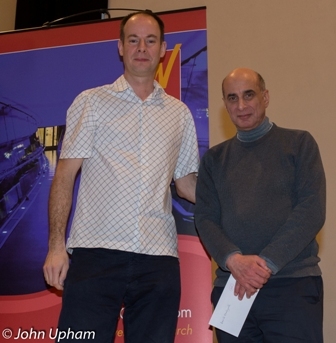 The winner of the third prize, Jonathan Mestel, was unable to be present at the prize-giving. All photographs are Copyright © 2014 John Upham Photography. 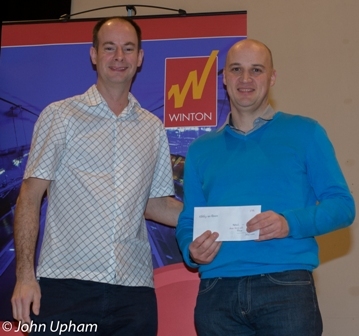 1st Prize – John Nunn. 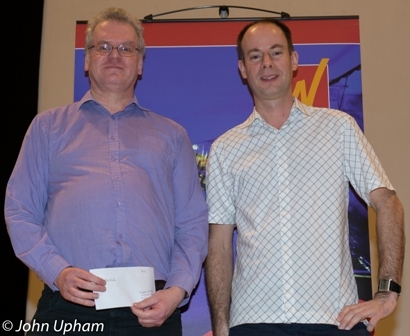 2nd Prize – Dolf Wissmann. 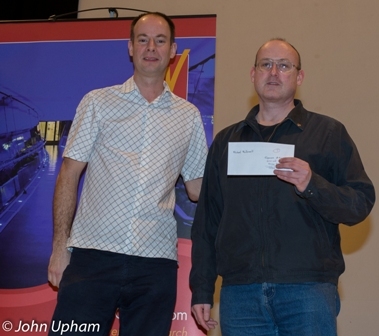 4th Prize – Colin McNab. 5th Prize – Eddy van Beers. 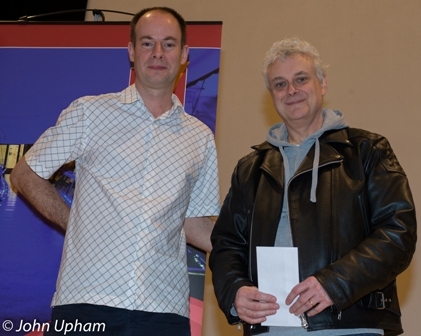 6th Prize – David Friedgood. 7th Prize – Michael McDowell. 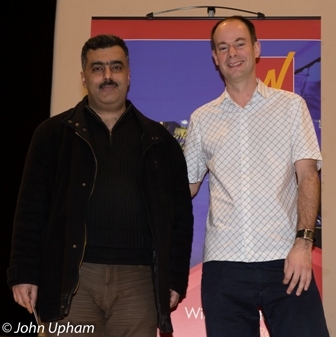 Highest placed first-time finalist – Ghassan Jamal. Highest placed finalist rated under 2100 – John Gemmell. After the untimely death of Chris Reeves, David Shire kindly took over the Twomover section sub-editorship of The Problemist. He has now handed the section over to John Rice, who will continue to run the section until a suitable replacement for the running of this important part of the magazine can be found.